Sun. Nov. 11, 2018 11–11:30 a.m.
Join us in honoring the men and women throughout our region for their dedication and service in our U.S. Armed Forces. The ceremony includes recognition of the 2018 Distinguished Alumni Veteran Award recipient, distinguished speakers, presentation of the colors and a performance by the Husky Band. Cake and coffee will be offered at the reception afterward at 11:30 a.m.
Ceremony features Patti Taylor, who will be honored with the Distinguished Alumni Veteran Award in recognition of her military service and her work since service. No RSVP is required for this event! Parking is complimentary on campus all day, on Sunday, November 11. For ADA parking, please enter the Central Parking Garage and follow the signs to Kane Hall for access to the elevator. The University of Washington is committed to providing access, equal opportunity and reasonable accommodation in its services, programs, activities, education, and employment for individuals with disabilities. To request disability accommodations, please contact the Disability Services for Students at least 10 days in advance at drs@uw.edu (email) or 206.543.8924 (voice and relay). 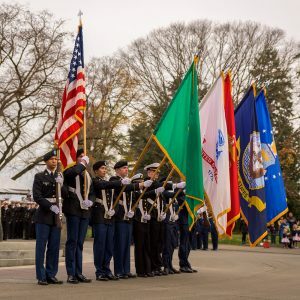 To view the whole lineup of Veterans Appreciation events, visit vetlife.washington.edu/appreciation.